By Daniel Horowitz--In response to the worsening humanitarian crisis in the Cree First Nations community of Attawapiskat, on James Bay in northern Ontario, United Jewish Appeal of Greater Toronto has established the Attawapiskat Emergency Relief Fund to raise funds to assist the citizens of that community with basic necessities of life. With a shortage of suitable housing, many men, women and children have been forced to live in uninsulated shacks, trailers and tents without drinking water, heat or even blankets. As another harsh northern Ontario winter approaches, these men, women and children will soon be at even greater risk. Many of the community's children have already contracted the flu as well as a number of skin infections. "It's hard for most of us, who take life's basic comforts for granted to even imagine what these unfortunate people must be going through, particularly in our own province," said Ted Sokolsky, President and CEO, United Jewish Appeal of Great Toronto. "But, as fellow Ontarians, and as Jews, we have a responsibility to take care of those in need, particularly here at home. And, by following our commitment to the Jewish value of tikkun olam, "repairing the world", United Jewish Appeal established this fund to do just that." United Jewish Appeal will be working with trusted agencies on the ground in Attawapiskat to ensure that the supplies required most, get to the people of Attawapiskat as quickly as possible. 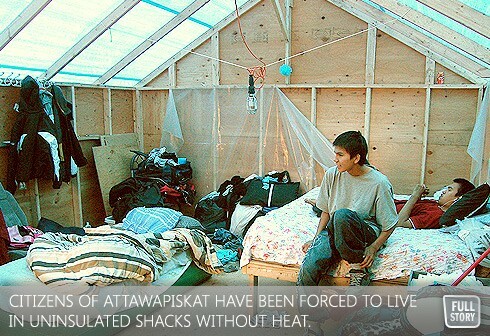 To contribute to UJA's Attawapiskat Emergency Relief Fund, please visit ujadonations.com/Attawapiskat or call 416-631-5705.